or moons, comparable in size to the Earth's moon. These satellites travel in nearly circular orbits around Jupiter, over its equator. 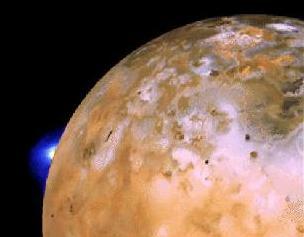 The closest of these moons to Jupiter is Io (pronounced either "EE-oh" or "EYE-oh"). deposits, some made of once-molten rock as on Earth and some of once-molten sulfur. 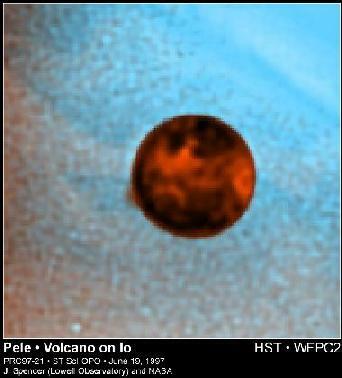 This lava surface was produced by the many volcanos scattered all over Io. Many of these volcanos are still active, producing either lava flows or enormous fountains called "plumes," which can be a hundred miles high or more, or sometimes both lava and a plume at the same time. gas escaping from the volcano's interior. As this invisible gas expands into space, it cools and freezes into something like snowflakes, so that the plumes can be seen. Io has an extremely thin atmosphere mostly composed of sulfur dioxide which has escaped from its volcanos. Its peak density is about ten million times less than that of the Earth's atmosphere, and is very cold (no more than 130 K = -225\deg F) near the ground. At higher altitudes the atmosphere is probably warmer because electrical currents flow through the atmosphere, driven like the current in a generator by Io's motion through Jupiter's magnetic field. Io's atmosphere's most unusual feature is that it condenses as ice onto the surface at night and evaporates back into the atmosphere by day. Because Io rotates on its axis once about every 42 hours, the patch of atmosphere follows the sunlight around Io while the night-time vacuum moves around towards the opposite side. With atmosphere on one side of Io and vacuum on the other, permanent strong winds, approaching the speed of sound, blow perpetually from the sunny side to the dark. Because the atmosphere is so tenuous, these winds blowing at hundreds of miles per hour do not seem to move much dirt or other rubble on Io, although there may not be much rubble to move because the surface of Io is frequently resurfaced with fresh lava. around Jupiter. These molecule's orbits do not move far from Io's orbit, which is nearly a circle centered on Jupiter, so all together they look from the outside like a donut-shaped cloud of gas rotating around Jupiter the way that an auto tire rotates on its axle (see animation). Logically, this cloud should be called the Io neutral gas torus, by analogy with the Io plasma torus (LINK) (also see below), but alas it is not. 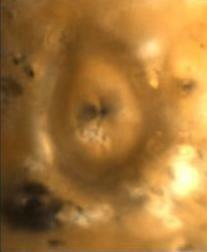 come from Io and its accompanying donut-shaped cloud, this plasma cloud is also donut-shaped. Because of its shape, it is called the Io plasma torus (LINK). It also rotates, but with Jupiter (10 hour period) instead of the slower orbital speed (42 hour period). Because Jupiter's magnetic field is tilted, the Io plasma torus rotation has a wobble or shimmy, like a car tire with a bent hub (see animation).